Although there are a number of different uses for WinCounter, the most common use is to count people. To do this you need a sensor to automatically detect the people as they enter your premises or a manual switch that a person can press when you want to count a person or event. There are a wide range of sensors and switches that will work with WinCounter. Click here to see pricing for our range of package deals that include sensors. If you have a special scenario that may need a different sensor or switch, fill out this form to let us know the details and we will recommend an appropriate sensor or switch. You can also use a third party supplied sensor or switch. WinCounter can use any sensor or switch that has a 'dry contact' switch output. All sensors require a WinCounter Interface (a special plug to connect it to the serial port on your computer). If you need to know if a specific sensor will work with WinCounter, contact us. Sensors automatically detect a person walking past them and trigger WinCounter. Typically sensors detect movement, but there are other special sensors available that can detect heat, light, temperature, water level etc. These sensors project a beam of light across an entrance. When a person walks through the door it breaks the beam and a pulse is sent to WinCounter. This is the most convenient type of sensor because the transmitter and receiver are built into one unit. The light beam from the transmitter bounces off a reflector and is received back at the receiver. This type of unit is easier to install because any cables only need to be run to one side of the doorway. 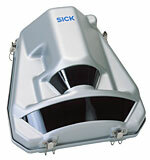 The WL260 and WL250 sensors are two popular retro-reflective sensors manufactured by SICK (a world leader in sensor technology). The majority of WinCounter installations use these sensors. These sensors work well for openings up to 8 metres wide. They produce a light beam which is reflected back to the unit from a polarised reflector mounted on the other side of the door opening. They have a small LED on the top of the sensor that lights when the reflector is aligned. They are waterproof and dustproof industry strength sensors (rated IP67). They come with mounting hardware and a reflector. Installation requires cable to one side of the door. A through beam sensor is similar to a retro-reflective sensor only it has a separate transmitter and receiver. It does not rely on a reflector to bounce the beam back. These sensors are often more suitable for covering wide openings as they can generally cover a larger distance. They require power cable to both the transmitter and receiver and so they can be more complex to install. A typical long range through-beam outdoor sensor used to detect over wider openings such as a vehicle entrance. A passive sensor generally detects changes in heat as a person walks past it. These sensors cover a wide area and are not as accurate as a beam sensor. The basic models tend to be slightly lower cost than beam sensors because of their wide use in security alarm systems. These sensors can be used as an overhead sensor and in some cases they can detect the direction of movement so you can separate incoming and outgoing counts. If you need to count people in a very accurate manner over a large area then you may need to install a specialist people counting sensor. These sensors have complex processing electronics that single out patterns of people moving over large areas. They can detect individual people in groups and work out which direction they are moving. These sensors provide excellent results, but they are many times more expensive than the basic sensors outlined above. If you need more information on specialist sensors, please contact us. Your sensor or switch needs a WinCounter Sensor Interface Unit that connects your sensor to the serial port of your computer. These often use optical isolation circuits to electrically isolate the sensor from the computer. Because WinCounter can read data from up to three sensors per serial port these units normally come with one, two or three sensor inputs and a serial port output. You can use a switch to trigger WinCounter. A popular use for a key-fob switch switch is in a club or bar situation where a door-person presses the switch every time a patron enters. When a patron leaves the door-person presses another button. This keeps an accurate count of the total people in the building at one time. This is suitable for use as a doorbell or mounted on a bench-top. It can be used to trigger WinCounter manually. One scenario is to connect a "ring for attention" switch to WinCounter so you can keep a record of each time the bell switch as been pressed. You can even use the sounds built in to WinCounter to play an appropriate bell sound. Floor mat switch for detecting when a person steps on it. Contact us if you need more information on the different types of switches. Plug-pack power adaptors. You will require a plug-pack suitable for your local electricity supply. Please contact us for power supply requirements. Wireless receiver for remote switch. Includes cable and interface for connecting to the serial port of your PC. At least one two button transmitter is required to work with this unit. Requires plug pack or batteries. Two button key chain wireless remote switch (works with receiver above) This is ideal for manual counting. eg. A person greeting patrons at a door can click this switch to count people entering or leaving. Battery included.